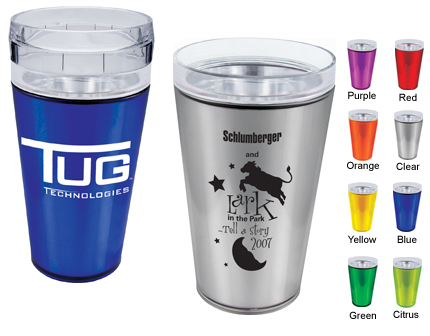 Our Custom-Imprinted Thermal Cups and Pints are perfect for clubs, fraternities, sororities, promotions, and much more. Choose from 12 and 16oz size Thermal Cups with either a printed foil or 4-color process insert. Low 50 glass minimum to get started with our Custom-Imprinted Thermal Pints and Cups simply call 1-800-233-0828. TPS116 16 oz. 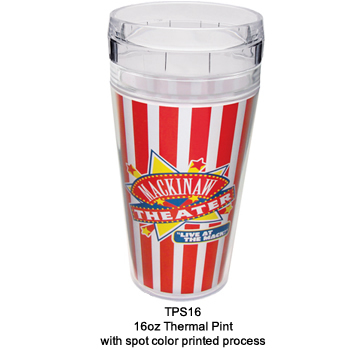 Thermal Cup with White Spot Printed Insert 5.95 5.49 5.39 5.25 5.15 4.95 7¼" 5"
TPP116 16 oz. Thermal Cup with 4-Color Process Insert 6.89 6.49 6.29 5.89 5.69 5.55 7¼" 5"
TPF16 16oz Thermal Cup w/Foil Insert 5.89 5.53 5.11 4.99 4.87 4.73 3" 3"
It's easy to get started with your Custom Glasses - simply call 1-800-233-0828, and then e-mail your camera-ready artwork to (you can also mail or fax your design). Production time is about three weeks. Rush delivery is available for an additional charge.